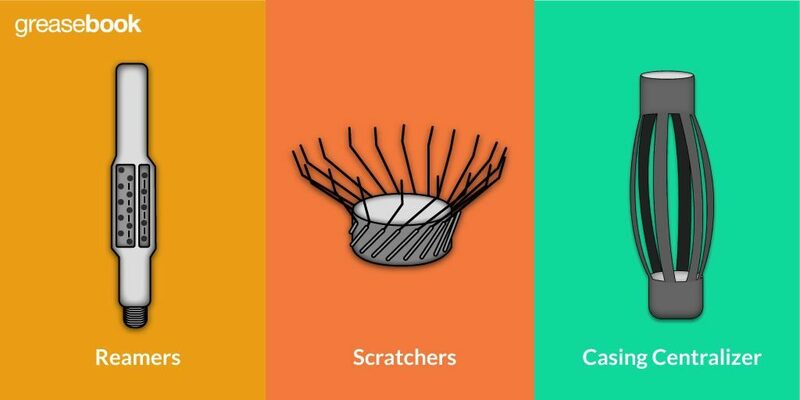 Before any product from a well can be sold, it has to be separated from all the impurities and contaminants that are also brought up from the well. When the well is primarily producing natural gas, the major concern is scrubbing liquid vapor from the saleable gas. Gas purchasing companies will usually have requirements for the gas’ dryness before they will accept it. Other valuable hydrocarbons may also be produced alongside natural gas, which when separated out can be sold. As with crude oil producing wells, most of the separation happens in the tank battery. The majority of the equipment in the tank battery for a gas well will be used to remove liquid from the natural gas. Three phase separators are pretty common choices for gas producing wells; the ‘three phase’ part means that the vessel separates gas from fluid, and also separates the fluid into water and any liquid hydrocarbons. Unlike separators used with crude oil wells, these separators are usually under high pressure. A separator used for separating oil from gas is usually under, at most, 100 pounds of pressure. By comparison the separators used for gas wells are under at least 1,000 pounds of pressure, and may have a max test pressure of about 2,000 psi. To contain such a high pressure, separators chosen for a gas well are usually small, with a diameter of 2 ft or less. The construction of the separator is also usually much heavier, including thicker walls and tougher gauges and valves. 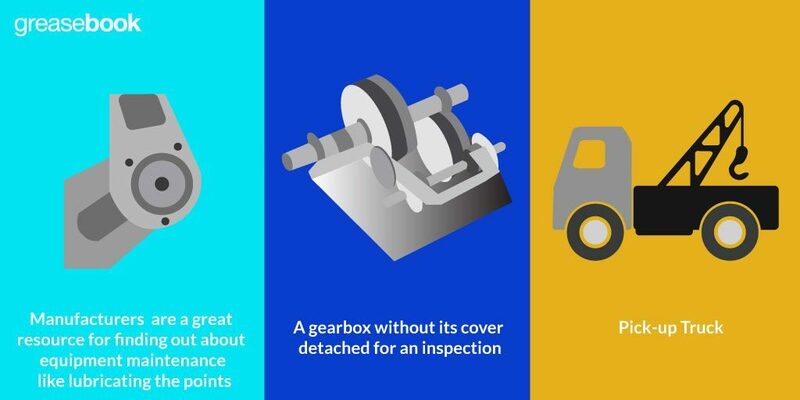 As a general rule, whenever a piece of equipment is visibly stronger and more rugged it is likely to be designed to handle high pressures. 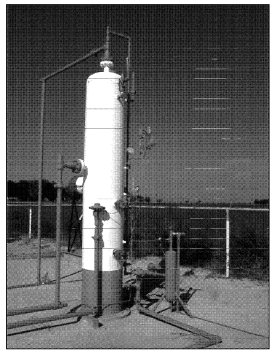 A common type of separator used for gas wells is a vertical separator. An example of one can be seen in Figure 1. 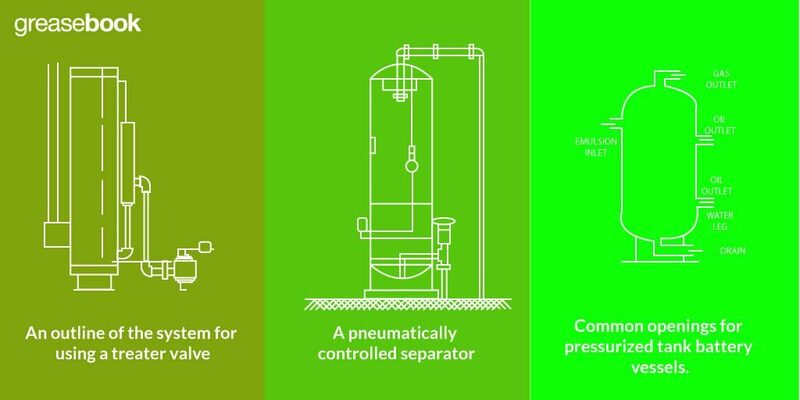 Three phase separators are chosen frequently, as they both separate liquid from gas, but also separate water from liquid hydrocarbons. Figure 1. An example of a three phase separator that operates under high pressure. In the example in Figure 1, the inlet line can be seen on the center-left of the separator. The gas flows up to the gas outlet at the top, where it is sent on to a scrubber, seen at the bottom right. The scrubber is shop made, and is used to remove any remaining vapor. At the upper right are safety devices, such as safety valves and rupture discs. Liquids fall to the bottom of the separator. Liquid levels are controlled by a pair of floats, with the exterior parts of the floats being visible at the center-right of the separator. The top one is an indiscriminate float, meaning that it will float on both oil and water. It therefore controls the level of condensate, a form of lightweight, liquid hydrocarbon. When the condensate level is high enough, the diaphragm valve (the lowest line on the left) will open and allow fluid to flow to stock tanks. The lower float is designed to float on water but fall through oil, and therefore is used to control the water level in the separator. These sorts of floats are called discriminate floats. This float controls another diaphragm valve, which when opened allows flow into the water disposal system. Figure 2 shows a closeup of these components where each is easier to see. Figure 2. A close up look at the separator and its valves from Figure 2. At left is a gas scrubber custom made in a shop. For smaller wells that have lower production volumes, the tank battery will often be much simpler. A single separator, a tank for holding waste water, and a meter for measuring gas production may be all that is needed. Figure 3. 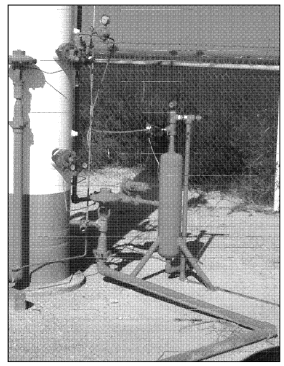 A low production gas well. 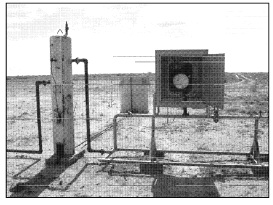 Gas wells may have a pressure two or three times the operating pressure of a separator. This can cause problems when water vapor is produced from the well along with natural gas. As the gas expands in the relatively lower pressure of the separator, it will cool extremely quick. The drop in temperature will freeze the water, creating a block in the lines, usually at the choke valve of the wellhead. This will often cause production to cease. With no production and no gas expanding to lower the temperature, the ice melts. Eventually, the well begins to produce again, until ice forms once more and the cycle is repeated. Obviously this is an inefficient way to run a well. 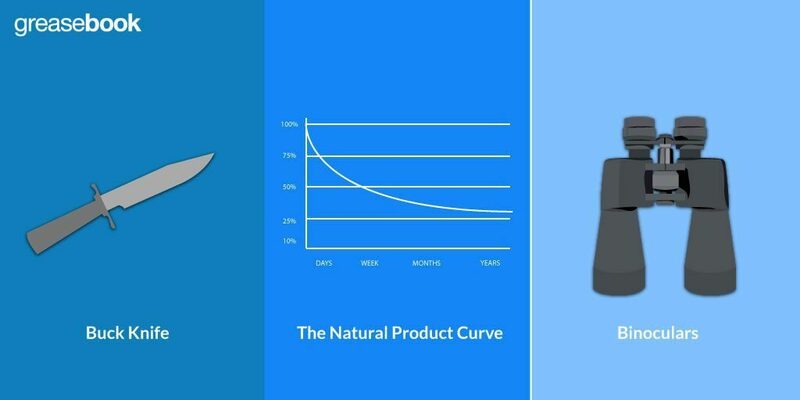 To address the problem, a few solutions have been developed. The most common is a separator that uses the water bath that is shown in Figure 4. Gas from the well flows back and forth through a pipe surrounded by hot water. The water heats the gas, which keeps ice from forming at the choke valve. Gas then gets piped to the three stage separator, which functions much like any other separator. Gas breaks out from the fluid and is piped up the gas outlet. Water falls out to the bottom of the separator, and is drained out to the water disposal system. 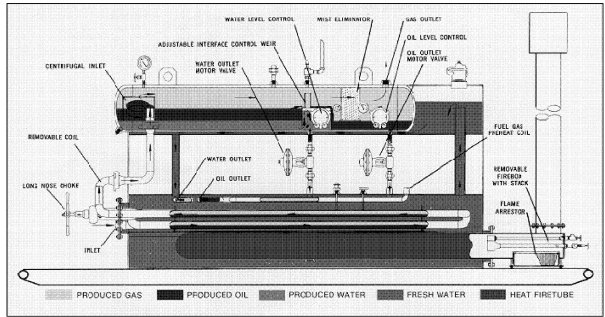 Any oil floats on the water and flows out to a holding tank. Figure 4. 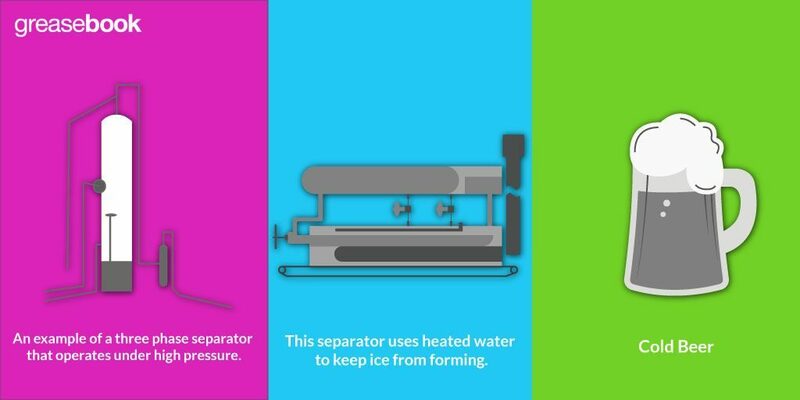 This separator uses heated water to keep ice from forming. The heated water in the bath will need to be topped up occasionally, as it will gradually evaporate away. Distillate, a liquid hydrocarbon that is one of the possible products of a gas well, may be difficult to separate from the gas. A smaller, lower pressure separator may be added to the tank battery. The added vessel will scrub out any remaining vapor from the gas, which may lead to a rise in distillate production.